Save Summer in a Bottle | Food It Yourself! A few years back, the town I live in gave away trees. No joke- they just handed them out to residents for nothing more than a phone call stating a request. We got 2 Montmorissey dwarf cherry trees. The trees have been reasonably productive. However, birds have been eating most of the fruit. I decided 2015 would be different. However, I forgot to put up bird netting. On June 26, 2015, I boldly fought off the sparrows and juncos- even an ornery robin- for a small amount of fruit. (Okay, I walked towards to the trees and the birds flew off.) My harvest was not enough for a batch of jam or enough even for a pie. Then I remembered a recipe I memorized the last time I had free access to a tree that yielded tart cherries. An easy and delicious way to preserve this super-short season fruit: ginjinha, a cherry flavored liqueur from Portugal. I enjoyed it so much the last time I made it that I committed the recipe to memory in case I lost the paper I wrote it down on. Yes, I have lost that paper. Step one: Remove the cherries’ pits. 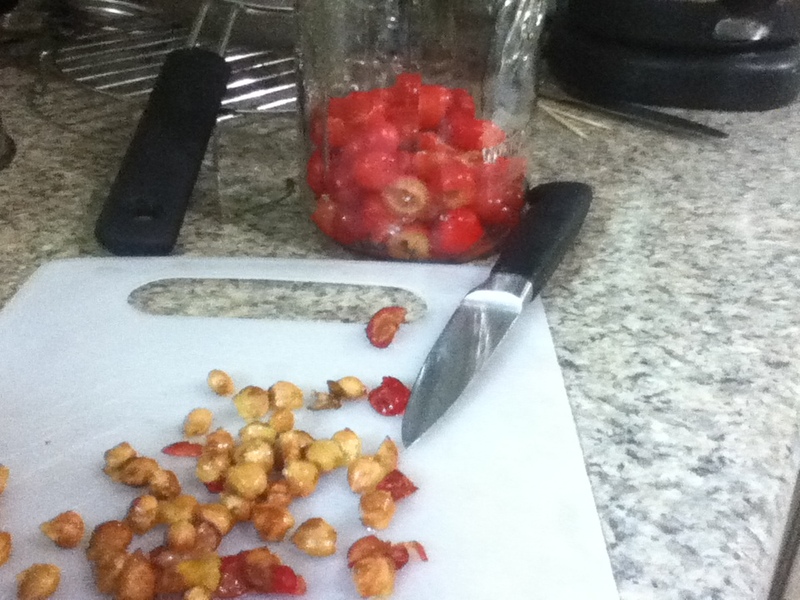 I used a small, sharp knife as the cherries were too small for my pitter. Step two: Fill a jar 1/3 full of fruit. 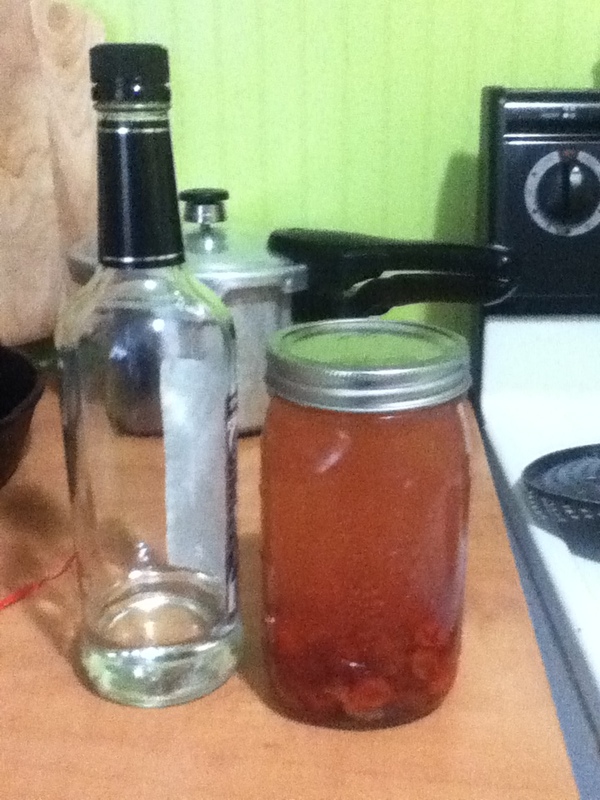 I had just about enough to get 1/3 of the way up a quart mason jar. Step three: Add plain white sugar to half the height of the fruit (see how this would work for any jar you happen to have?). 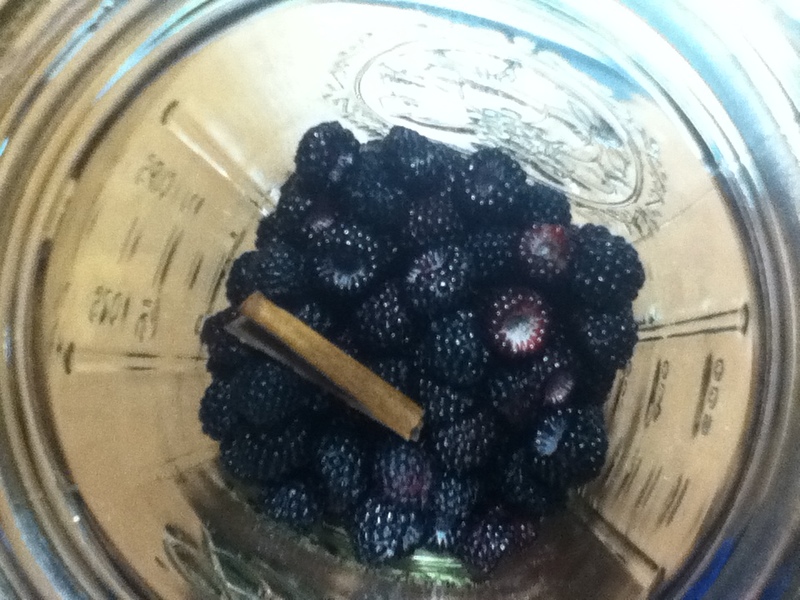 Add a 1-2 inch piece of cinnamon bark. Now shake it! Step four: Leave the jar in the refrigerator for 2 or 3 days. Give the jar a shake a few times per day. Step five: Add what the recipe called “neutral spirit” to the top of the jar. The internet explains that any kind of aguardiente (“fire-water”) will suffice for ginjinha. My favorite choice is the cheapest 100 proof vodka I can get my hands on. Yes I use the cheap stuff. The final product is going to taste like cherry and cinnamon and summer and happiness whether you splurge on top shelf or buy the bottom of the well. Save your cash to buy more mason jars- canning season is coming. 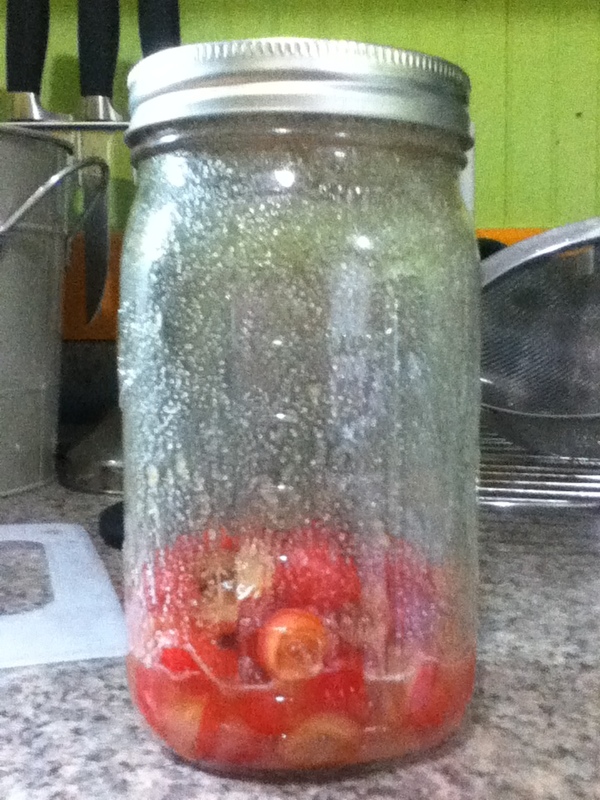 And now the highly time consuming step six: Let the jar sit in a cool, dark place until December. That’s right- it takes a good five or six months for this stuff to mellow out. Part two of this adventure will be posted at that time. I’m trying the same procedure with some wild raspberries. Can’t wait to share the results.